While searching for yarn for No More Snow! in the closet, I came across the pillow inserts I had intended to become the Rainbow Collection’s ombre pillow set over 2 years ago. I was on vacation so I got all “I’m going to make everything I’ve been meaning to make for like 3 years.” I didn’t get quite that far, but I did whip up these pillows pretty quickly. 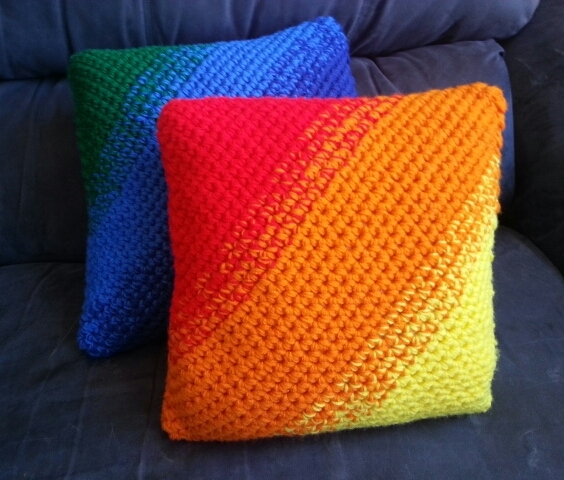 The Ombre Pillow Set includes 14″ and 16″ pillows made in the round using all single crochet and the painted crochet technique from Somewhere Over the Rainbow. You basically single crochet in the round with three strands together throughout the pattern, swapping out one strand at a time to get the ombre effect, and do 3 sc in the corners. 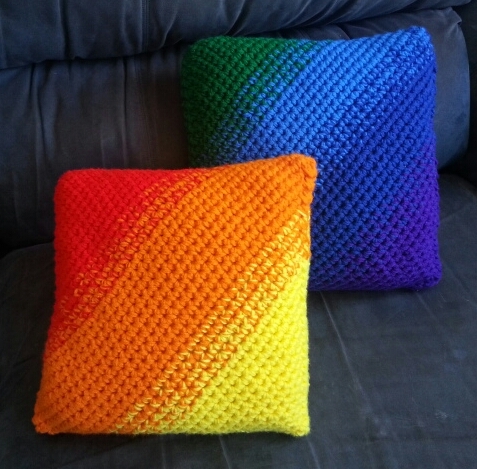 So here’s the next pattern in my Rainbow Collection Series, the Ombre Pillow Set. 7 skeins of Red Heart Super Saver Solids (worsted weight yarn in 364 yd skeins). 1 skein in each of the following colors: Hot Red (Red), Pumpkin (Orange), Bright Yellow (Yellow), Paddy Green (Green), Blue (Blue), Royal (Dark Blue), Amethyst (Purple). *See Notes below as you may find it easier to work from 2 skeins of each color. You will need a pillow insert 2 inches larger than the finished pillow size. You will be crocheting in the round from corner to corner and will not turn. I do recommend marking the corners with stitch markers and moving them up along with your work. Hold 3 strands of yarn together throughout the pattern. The painted crochet technique creates an ombre effect by changing the color of one of the three strands at a time. You will be dropping one strand and picking up a new color strand when indicated. Before you start, make 1 ball of each color around 90 yards long. When you need two strands of a color, pick up from both ends of the skein. When you need the third strand of the same color, add the ball you just made. *You may just want to buy 2 skeins of each color instead to avoid making the balls of each color. It’s easier. Turn inside out and weave in the ends, turn right side out and continue. Put the pillow insert in. You will be crocheting around the pillow insert for the rest of the pillow. Finish off leaving a long tail, thread tail through the last six stitches and pull tight. Stitch a few times to close up the corner and weave in the ends. Turn inside out and weave in the ends, turn right side out. Put the pillow insert in. 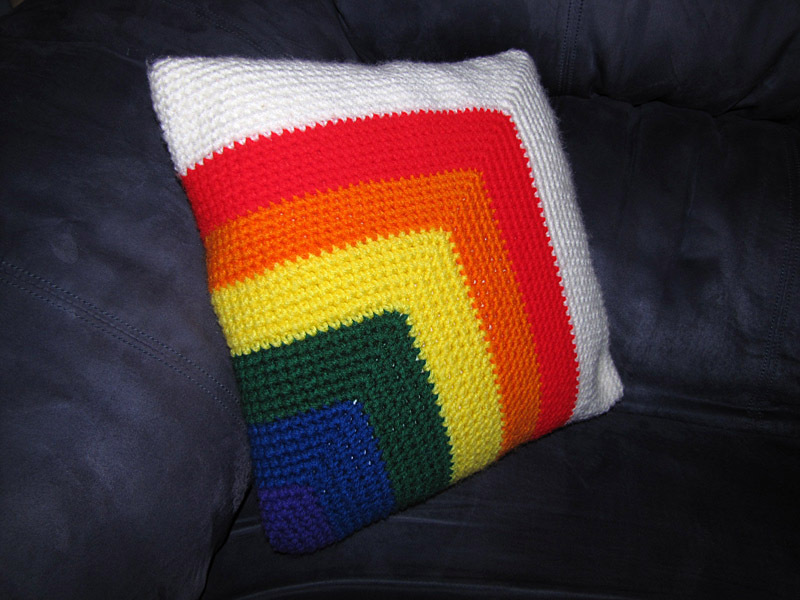 You will be crocheting around the pillow insert for the rest of the pillow. I was very sad to hear of the passing of an old friend from high school earlier this week. Tania this pattern is dedicated to you. I hope you have finally found peace on the other side of the rainbow. Tania was a kind and sad creative soul. Her documentary New York City Subculture 1996 about the NYC mid-90’s punk scene lives on on YouTube and her book of poems, Elusive, is available for Kindle. I’ve always been a big rainbow fan. Growing up my mom even painted a rainbow on my wall and made me an amazing satin rainbow Halloween costume one year. My son inherited my love of rainbows and Mexicana is his favorite yarn. He has both magic rainbow slippers and mittens made from it. So as Hurricane Irene approached NY I had to make sure I had all my crochet projects prepared for a possible week without electricity. 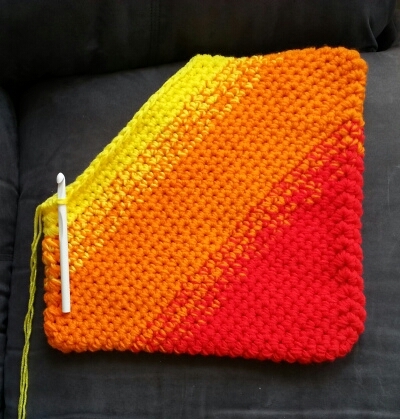 I found a rainbow afghan pattern on Etsy and started working on Rainbow After the Storm. Shortly after I started I kept thinking about possible rainbow pillow patterns I could make to match. I couldn’t find that many rainbow pillow patterns so I designed a few. 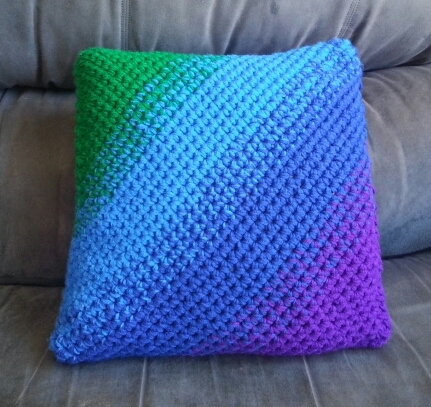 The Mitered Corner Pillow is a 14 inch square pillow made in the round using all single crochet. I used a pillow insert, but you can just use polyfill since it is all single crochet, the fabric is tight enough to keep the stuffing from showing through. You basically crochet in the round with 3 sc in the corners. 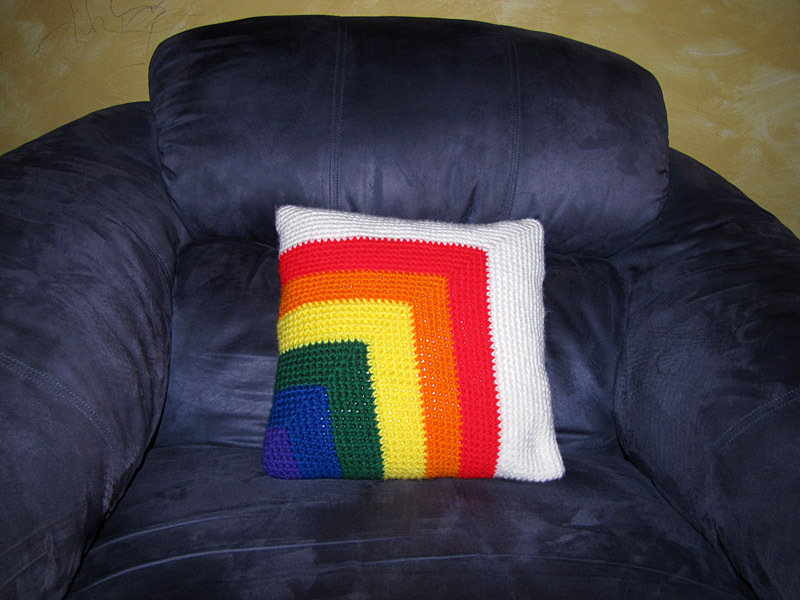 So here’s the first pattern in my Rainbow Collection Series, the Mitered Corner Pillow. Red Heart Super Saver Yarn in Hot Red, Pumpkin, Bright Yellow, Paddy Green, Royal, Amethyst, Soft White (or any worsted weight yarn you can find in ROYGBV and white). Less than a skein of each color. Finish off leaving a long tail to sew up the two ends. Weave in the ends at the color changes on the wrong side of your work. Using mattress stitch, sew up one side. Insert the pillow insert. 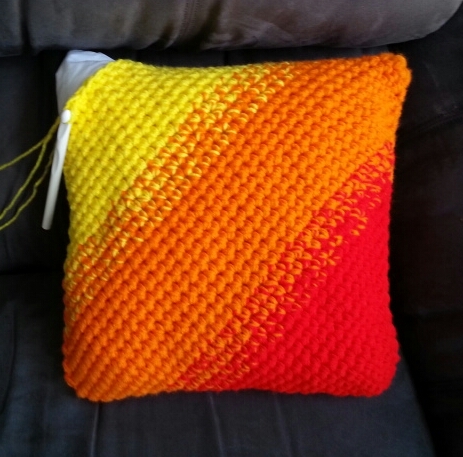 The pillow has negative ease, so stretch the crocheted pillow around the pillow insert. Using mattress stitch, sew up the other side of the pillow. Turn around and find a pot of gold. P.S. The first thing my friend said when she saw the pillow, ” Hey remember that rainbow you used to have on your wall?” Like I could ever forget.